and, consequently, exceeds to the ENRICHED RULE my mouth hits the floor in shock! What's the Enriched Rule? Adding an extra "oomph" to an already good deal! That's like going to the bank for a loan, and getting that loan interest free for 10 years-no strings attached, no credit approval required! :) Yep, all that AND a bag of chips! Lol! I'm such the 90s kid! 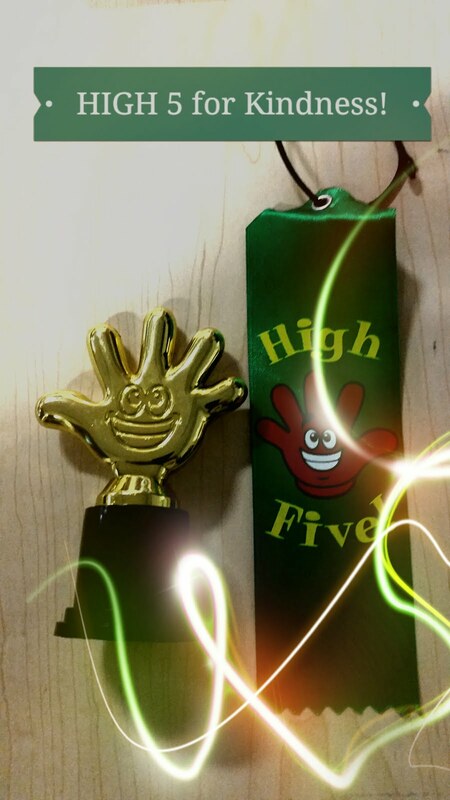 So...to get my kiddos psyched about kindness, I offered a "High-five" award for any students displaying random acts of kindness. Every morning via the announcements, I encouraged them to show kindness by performing various thoughtful acts, anywhere-anythime. Here are some HIGH FIVE WINNERS and the slides using the graphics from the Random Acts of Kindness website. Please, infect your school with kindness. It's a change that's 100 fold in enrichment and behavior success!